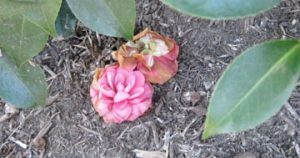 For camellia growers, ’tis the best of times and possibly the worst of times. Camellias—in particular, Camellia japonica cultivars—are beginning to bloom their branches off now. And if the winter is mild, fewer displays will be blemished by heavy frosts or prolonged subfreezing temperatures. However, there still could be trouble in this wintry paradise. Instead of enjoying pristine displays of flowers, some camellia gardeners might find blooms tainted with brown spots that grow bigger and eventually turn what could have been minor botanical masterpieces into works that can only be described as junkyard dog ugly. The ailment, caused by the fungus Ciborinia camelliae, and, in our region, quite common, is camellia petal blight. An infected blossom quickly turns completely brown within a matter of days, dies and falls to the ground. After death, there is life, but, in this case, it is not necessarily a good thing. At the base of infected flowers, the infringing fungus produces black, hard, fruiting bodies called sclerotia that drop to the ground with the blighted blossoms. 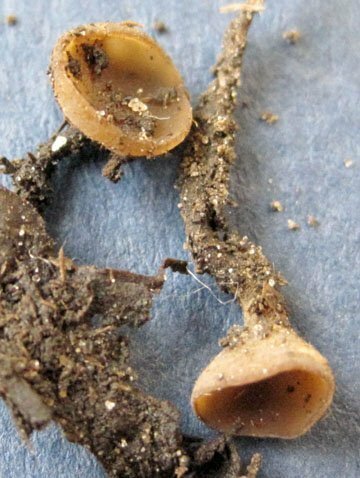 The sclerotia can remain dormant in the soil for up to five years, just waiting for conditions to be right. These conditions include high humidity, frequent rain showers and mild temperatures during bloom time—all of which are not strangers to our neck of the woods in the late winter and early spring. Once stirred up, sclerotia create small, mushroom-like structures called apothecia that release tiny spores into the garden, into the wind and into landscapes to do their dastardly damage in later years. It seems to be an persistent problem that can make it tough to enjoy pristine camellia flowers at this time of year, but gardeners, take heart—remedies are available. While commercial fungicides such as Captan and Mancozeb can be used against petal blight, there is a very effective no-cost, earth-friendly option—simply interrupt the life cycle of the fungus. Because most of the development of this fungus takes place in the planting medium underneath camellias, break up the party by putting metal to the petals. Rake up the spent blooms as they begin to carpet the ground. Yes, I know—a layer of freshly fallen, delicate camellia petals can be a beautiful sight. But they are also a potential breeding ground. So, get a camera, capture the moment and then rake ’em up. Don’t compost the spent flowers—petal blight spores can be carried up to a mile in the wind, so the best way to deal with this pestilence is to bag the petals and toss them in the trash. In the spring, the winter mulch around camellias should likewise be thoroughly raked up, bagged and discarded. Then, add a 1 to 2-inch layer of fresh spring mulch in its place, which, after it has done its duty, should be similarly sent off to the dump and replaced in the late fall. Petal blight is a tough problem to completely eradicate. But if you continue to police the growing ground around your camellias, it can be controlled, leading to better displays of dazzling flowers that herald the coming of yet another glorious spring.